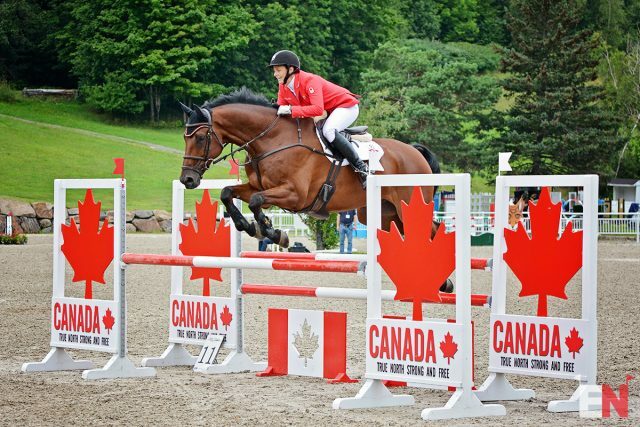 Canada is dominating three of the four FEI divisions here at the Bromont CIC Three-Day Event at the conclusion of today’s show jumping action in Quebec. Jessica Phoenix led the CIC2* after dressage with Pavarotti, but one rail down in show jumping opened the door for Bentley’s Best to move up to take the lead on 30.9. This pair won the CIC2* at Bromont in June, and the stage is set for them to repeat the victory tomorrow. “Benny,” an 11-year-old Trakehner gelding (Hirtentanz X Hauptstutbuch Baronesse XIII, by Eichendorff) owned by the Bentley’s Best Group, has extensive experience competing at the three-star level. Jessica decided to step him back to two-star level this year to solidify his form, and she is also thinking of him as a possible mount for the 2019 Pan American Games in Lima, Peru. Boyd Martin and Contestor, an 11-year-old KWPN gelding (Contango X Jer’s Princess, by Killer Jer) owned and bred by Denise Lahey, jumped clear to move up to second place in the CIC2* on 32.2. Dom Schramm and The Naked Horse Eventing Syndicate’s Bolytair B and Michael Nolan and SBT Good Guy both jumped clear rounds and sit tied for third place on 32.6. Fourteen of the 24 combinations (58% of the field) jumped clear rounds over Marc Donovan’s show jumping course in the CIC2*, but poles went flying in the CIC* divisions. Colleen Loach and Foreign Quality. Photo by Jenni Autry. Colleen Loach and Peter Barry’s Foreign Quality jumped one of the five clear rounds in the CIC* to move up from third place after dressage to lead on 25.9. “Badger,” a 7-year-old KPWN gelding (Warrant X Orsina II, by Calvados), won the 2016 USEA Young Event Horse East Coast Championships with Tim Bourke as a 5-year-old. Peter Barry purchased him in early 2017, and Colleen started competing him soon after. 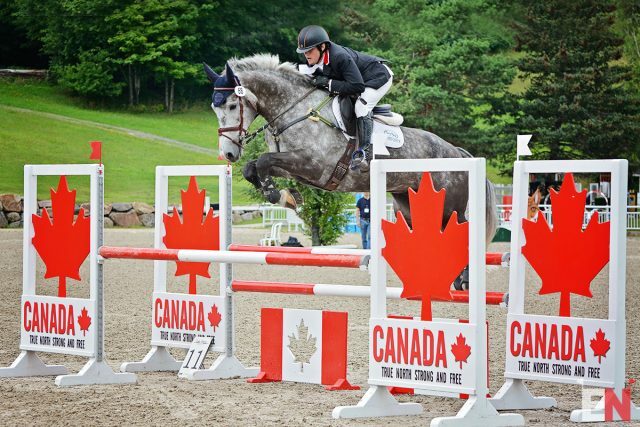 He finished fourth here at Bromont in June in his first CCI* and stepped up to Intermediate at the GMHA Festival of Eventing in Vermont last weekend. Colleen said she plans to wait to move him up to the two-star level until next spring. Waylon Roberts and Aletta Martin’s Wil Celtic Charlie jumped clear to move up to second in the CIC* on 26.4. Matt Brown and Anna Honeycutt’s Fernhill Chico led after dressage on 23.4 and slipped to third place with one rail down. Katie Lloyd and Cadence. Photo by Jenni Autry. 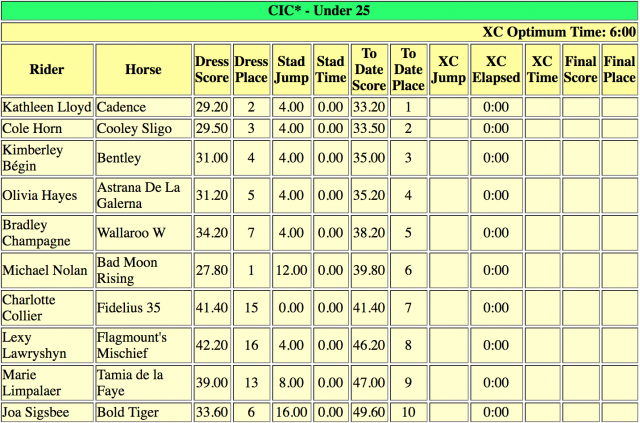 Katie Lloyd and Cadence are making their one-star debut one to remember, moving up to take the lead in the CIC*-Under 25 on 33.2 with one rail down. 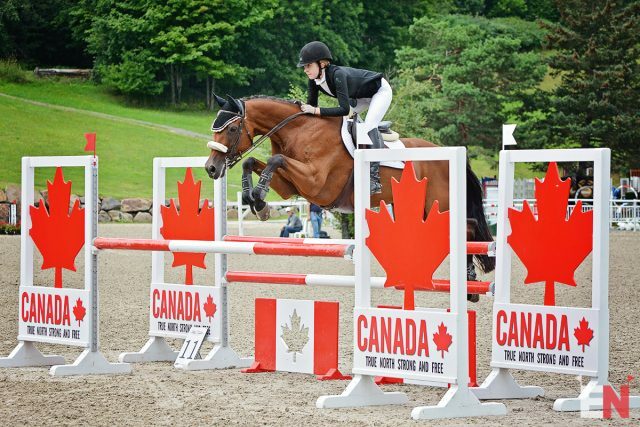 She bought Cadence, a 13-year-old Holsteiner/Canadian Sport Horse (Camiros X N’Thabiseng, by A Fine Romance) as a saddle broke 6-year-old from Kaitlin Breton-Honeyman, who bred the mare just outside Guelph. Katie earned her undergraduate degree in animal biology from the University of Guelph and is taking a break from school before going back for her master’s degree. She hopes to study equine probiotic research in sport horses. Originally from Dundas, Ontario, Katie now lives in Guelph and trains with Lynda Ward and Jo Young. Her ultimate goal for the rest of the season is to move Cadence up to Intermediate and ultimately aim for the Hagyard MidSouth CCI*. Cole Horn and Cooley Sligo. Photo by Jenni Autry. Cole Horn and his own Cooley Sligo, a 6-year-old Irish Sport Horse (Sligo Candy Boy X Town Land Pride, by Townrath Pride), had one rail down and moved up to second place on 33.5. 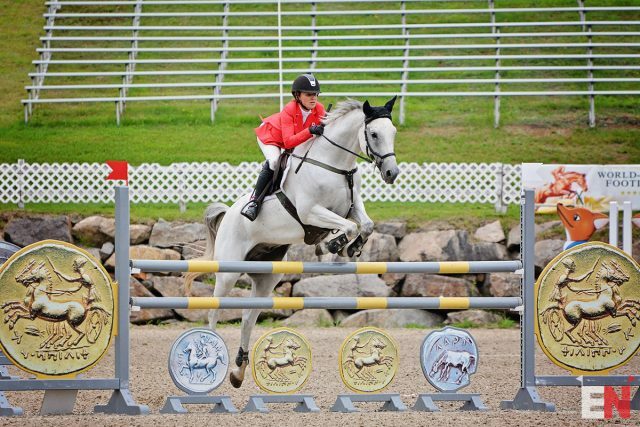 Kimberley Bégin and her own Bentley, an 11-year-old Trakehner (Krusader X Bonita) bred in Canada by Robin Cruickshank, also had one rail down to move up to third on 35.0. Only one pair jumped a clear round in the CIC*-Under 25 division — shoutout to Charlotte Collier and Fidelius 35! Looking to the Training divisions, Lauren Kieffer and Jacqueline Mars’s Get Gaudi jumped clear to hold the lead in the Open division on 22.1. Amanda Beale Clement and Megan Wilson’s BE Kilgoric Felix also jumped clear to hold the lead in the Training Young Rider division on 26.9. 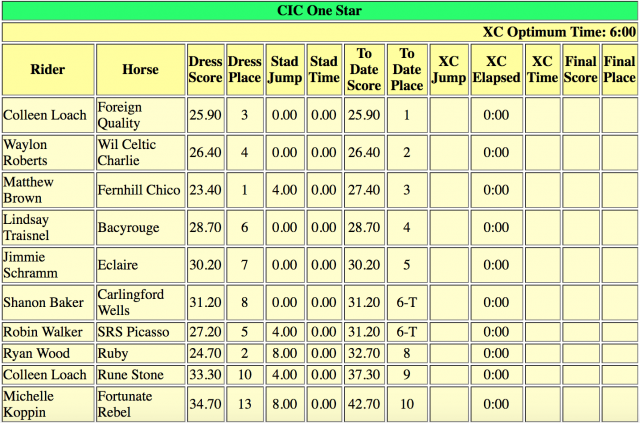 Click here to view full scores following show jumping. 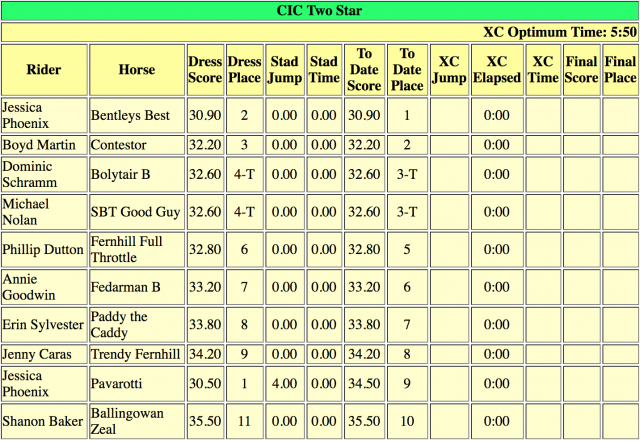 Boyd Martin and Long Island T lead the CIC3*; click here to read the full CIC3* report from this morning. Click here to view show jumping videos courtesy of David Frechette. Cross country day starts with the CIC3* at 8:30 a.m., followed by the CIC2* at 10:38 a.m., CIC* at 12:20 and Training at 2:44. Click here to view the full schedule. Stay tuned for much more from Bromont. Go Eventing.